Join us every Thursday until December 13 to do your gift and grocery shopping locally! With cigar-box guitars for sale! Artisan granola, energy bars, and nuts, made in Marietta, GA.
17-year-old Didi handcrafts earrings and ear cuffs, necklaces, bracelets, magnets and other jewelry and copper art. On Saturday, 11/17/12 from 9am-noon, there will be a “Give-An-Hour” workday at Johns’ Homestead Nature Preserve Park to help revitalize the home and surrounding property. This clean-up is a joint venture between Friends of Johns’ Homestead, DeKalb County, Tucker Civic Association, and the Tucker Historical Society ~ and will be the first of many workdays to help restore the 50-acre nature preserve area and the homestead itself. Learn more at the TFM Community Booth on Thursday, November 8. November 15 and November 29 — canned food drive. Stay tuned for more details. 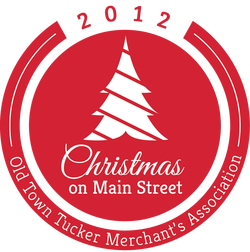 December 6 — Christmas on Main Street. Mercier Orchards, nestled in the north Georgia mountains, is a family owned and operated apple orchard. Be sure to come by this week for apples — the season won’t last much longer!